What is MailsDaddy NSF to PST Converter? MailsDaddy NSF to PST Converter is a most desirable tool used to convert IBM Lotus Notes emails, contacts, calendar events, To-do lists, notes etc into Outlook PST format. It is a one-stop conversion solution of MailsDaddy Software and a powerful tool which performs a migration process of NSF to PST flawlessly and accurately. It extracts all the Lotus Notes information and exports it in Outlook compatible PST format. Interestingly it fulfills all the requirements of the user and also provides some extra beneficiary options which user can use as per their choice to export NSF data into PST format. The software focused on each element of data during the migration from Lotus Notes to Outlook PST. A lot of platform doesn’t support NSF file format to open on their email client application. So there is much requirement of the best and valuable tools which can perform a quick and safe solution to retrieve the NSF data stored in Lotus Notes and export it in Outlook format. MailsDaddy NSF to PST Converter is single enough to fulfill all the user needs to perform a migration for Lotus Notes NSF to Outlook PST format. The tool fetches required or selected NSF data and converts it in PST format with added benefits. The tool is designed in such a manner which makes it easy to operate. The GUI interface of the tool is very simple so any professional or novice user can work on it without any trouble. The tool maintains all the folder hierarchy after the exportation. 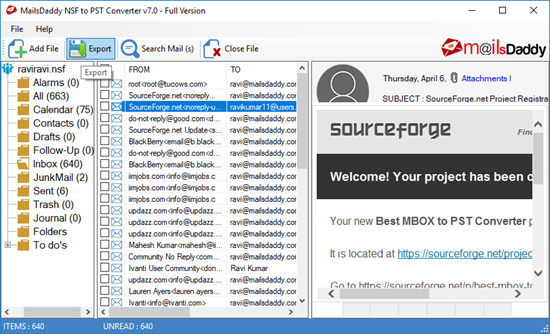 Keeps all the original mail formatting, inline images, and folder structure even after the conversion. How NSF to PST Converter Accomplish the Requirements? 1. Bulk Migration: Bulk migration is a very useful feature of the tool. It helps the user to export their selected or mass NSF data in PST format at once without any trouble. 2. Date Range Filter: If the user wants to convert their data of a specific date range for this the tool is able to fetch all the data of that particular date range and convert it in PST format with ease. 3. Search Mail: Sometimes user needs to migrate only important NSF emails instead of all NSF data. For that, this tool has an advanced option for Search mail. Using this option user can find desirable emails by just inserting the required field data. 4. Export Options: The software provides various export options like Export all folder, Export selected folder, Export all contact, Export all calendars, Export in MSG format etc. 5. Exclude “All” Folder: It is an advanced feature of the tool. This option is checked by default which uses to exclude the “All” folder in the formation of PST file. If the user wants to keeps “All” folder data then they need to uncheck it. This option is used to save the storage space and time of migration process. 6. Preview the NSF file: The tool fetch the NSF file from the local storage and load it quickly for the migration and generate a preview of the selected NSF file. 7. Generate Process Report: After successful completion of NSF to PST, the tool creates a Log file to preserve all the process reports of the migration. Convert all the NSF data in PST format at once. Preserve all the inline images during and after the migration is completed. Provides split PST option as per requirements. Convert NSF data in PST format or in MSG format as per the user’s choice. Exports Lotus notes NSF email addresses to SMTP format. There is no need of MS Outlook Installation in the local machine. Lotus Notes should installation is required to use this software. Processor: Minimum 2.4 GHz processor. Lotus Notes Version: Compatible with all the Lotus Notes editions. How much the cost of NSF to PST Converter? The MailsDaddy NSF to PST Converter comes with following purchase costs. The cost of the Personal User License is $99. Use in only 2 computers. The cost of the Business User License is $299. Provides two years free updates. The cost of the Enterprise User License is $599. In the same interface with a number of features seems the Converter tool complex but in reality, it is very light-weighted and handy solution for Lotus Notes to Outlook migration. The GUI interface of the NSF to PST converter tool is institutive and it is cost-effective and easy to use. Generally, the process speed of the tool is very good and it also depends on the NSF file size. The biggest benefit of the tool is there is no data loss and fluctuation during the process. Note: This article is only for informational purpose. The author posted a free review of the product(without any benefit from the product’s company). Please check more details (download, pricing, support etc.) about the product on the Product’s official website.